Rincon-Vitova supplies Sagebrush traps for yellow jackets and biocontrol of flies. Copyright © Rincon-Vitova Insectaries, Inc. 2007 All Rights Reserved. Fly enters through side holes drawn to scent of bait, to access bait. Fly drawn to light when leaving bait and travels through screen cone into containment area. Fly is unable to escape containment and dies. Established and proven cone style design. 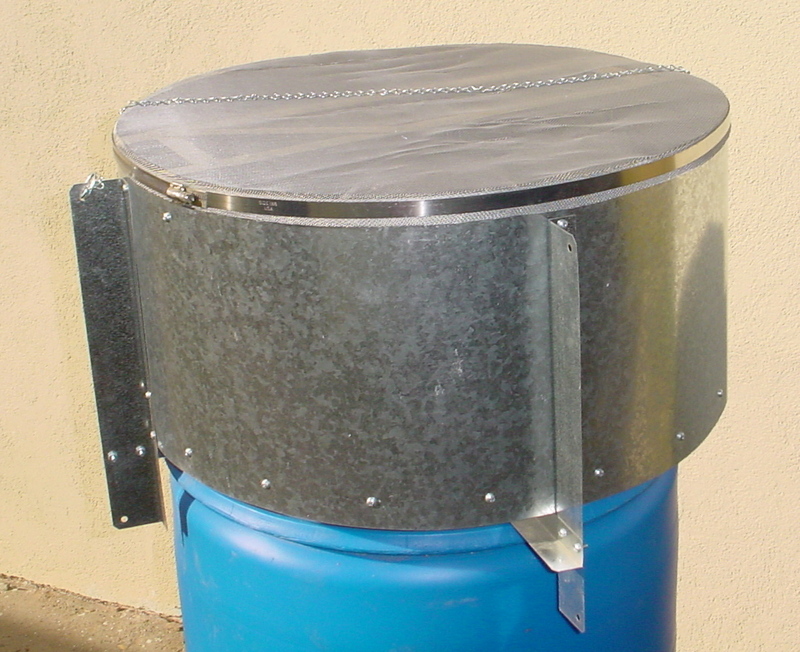 All metal construction: stainless steel clamp, aluminum screen, and galvanized steel. Bait with compost, manure, farm waste, and commercial fluid baits. Large size for low maintenance. Place the trap so that light enters the trap through the top. 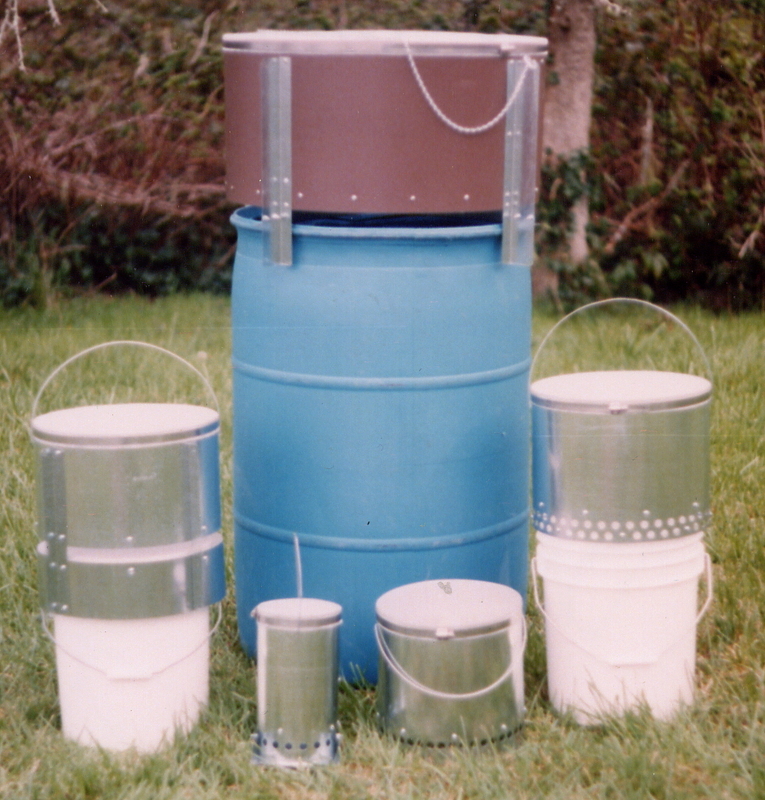 So the bait will last longer, a piece of screen can be placed over the bucket and under the trap for preventing flies from breeding and dying in the bait. Some flies are particular to location so place the trap where flies are located. A wood box open at the top can be constructed and placed around the trap to protect it from livestock when trapping ground hovering flies. 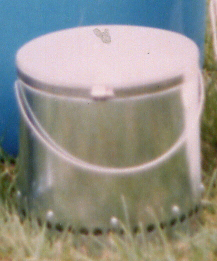 When placed on a bucket, the bucket can be wired to a fence stake to prevent it from being knocked over. Remove dead flies by unscrewing the hose clamp and slipping the top off. Tap out flies, then replace screen and clamp. Some recommended baits include, fish, shellfish, chicken scraps, chicken or dog manure, compost, and commercial fluid baits (2 oz/5 gal Farnam Brand Fly Trap Attractant works good with horses). Meat baits work best when rotten and manure baits work best when fresh. Most baits will need to be kept wet for effectiveness so add water as necessary to keep the bait from drying out. Yellow Jackets are an easy catch and just about any odorous meat scrap or bones will work. Some varieties of flies are more particular and experimenting with baits may be necessary. Fluid baits are low maintenance in hot, dry weather.